For special, large issues marked with an asterisk (*), add $2.50 to the sale price. Place order with and send check to ICPS, P.O. Box 34434, Bethesda, MD 20827. 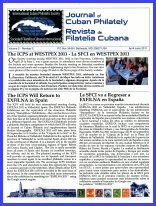 Use the email address of "treasurer@cubafil.org" to make PayPal payments (add 50¢ fee per issue). Contact our editor for more details. Our special thanks also go to the Rocky Mountain Philatelic Library (RMPL) for providing their printing facilities to print our publications. The RMPL is a wonderful philatelic library that is managed and supported by a very dedicated group of volunteer philatelists. Several ICPS members are also members of the RMPL. We urge you to visit the RMPL Website to learn more about this great philatelic library and consider becoming a member. The full content of the journal shall be provided in both English and Spanish. The journal shall be published in full color. The journal shall be available in hardcopy or electronic form. The Society's Editorial Board shall fully support the Journal Editor in the planning, preparation, publication, and distribution of the Society Journal. 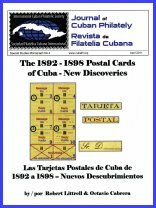 The Journal will also include a variety of other topics of a general nature such as Society news and reports, Treasurer's reports, auction results, committee and working group reports, letters to the Editor and responses, book reviews, ongoing activities in the world of Cuban philately, and anything else that might be of interest to Cuban philatelists in general. Society members are encouraged to submit items to the Editor for consideration to be published in the Society journal.